What does MCM stand for? What does MCM mean? 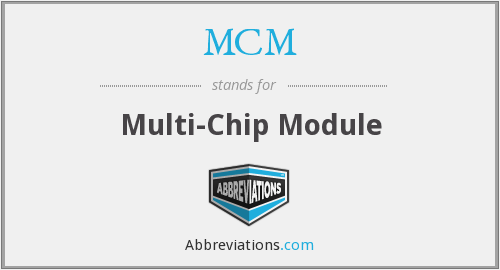 This page is about the various possible meanings of the acronym, abbreviation, shorthand or slang term: MCM. MCM is a French music video TV channel owned by Groupe MCM. It was started in 1989 by Groupe Europe following the MTV model. MCM broadcasts 3 encrypted music TV channels "MCM France", "MCM Pop" and "MCM Top" as part of the "CanalSat France" subscription TV package from the Astra 19.2°E cluster of Direct-to-Home broadcast satellites at the 19.2 degrees East orbital position. From 2001 - 2003, MCM also broadcast in Thailand, operated by local licensee Broadcast Network Thailand playing a mix of alternative and electronica music, and hosted by a variety of bilingual VJs speaking Thai and english, including Sara Malakul, Kipsan Beck and Fah Chanika Sucharitkul. Couldn't find the full form or full meaning of MCM? Know what is MCM? Got another good explanation for MCM? Don't keep it to yourself! "MCM." Abbreviations.com. STANDS4 LLC, 2019. Web. 22 Apr. 2019. <https://www.abbreviations.com/MCM>.